Anyway. Today's nails are named as such because in direct sunlight, it's hard to see the design, you have to be in the shade or view sort of at an angle to see it over top of the super gorgeous Zoya Ivanka, which is seriously one of the prettiest glitters ever. 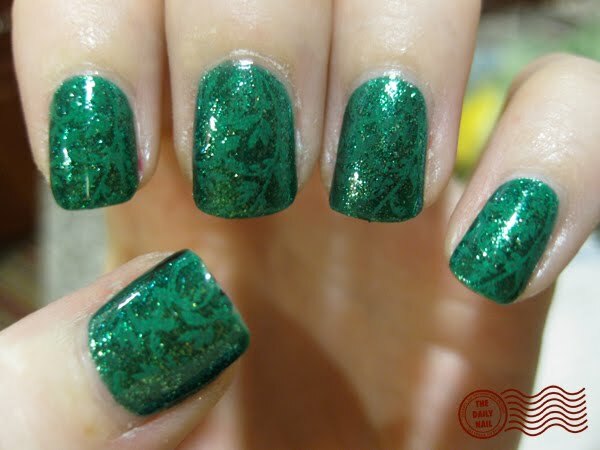 I used Zoya Ivanka as a base, with CND Green Scene applied with Bundle Monster plate BM20, I used the scrolled pattern. Topped everything off with 2 coats of Seche Vite top coat, because that's just how I roll, dig? I love subtle konads like this! Gorgeous! I love how understated this is. Gorgeous! That is seriously one of the prettiest manicures I have ever seen. Elegant, understated. Like fine jacquard. Just lovely. It doesn't even look like nail polish! it looks like porcelain! LOVE it!! The design is so subtle on top and that's what makes it great. I loved, is so beautiful <3 u are the best ! You like Lady Gaga ? I love, can you do a nails for gaga ? Fantastic work! So inspired to do my nails! Heey, I would like to know what do you use to do these efects, is it a special pen?